Lenin‘s life hung in the balance after he was shot by Fanny Kaplan, but now he appears to be on the mend, to the relief of his Bolshevik followers. Kaplan meanwhile has been interrogated and probably tortured by the Cheka, the Soviet political police. They are keen to discover whether she was working as part of a wider plot, either with underground members of the Socialist Revolutionary Party or with foreign powers. She denies any involvement with others, though in actual fact she appears to have been part of a network of SR cadres operating independently of the SR-led government in Samara. Today the Bolsheviks decide that they have interrogated Kaplan for long enough. Deeming a trial to be an unnecessary bourgeois frippery, she is summarily shot; her body is then burned before burial in an unmarked grave. The Cheka meanwhile has unleashed a Red Terror on the real or imagined enemies of the Revolution. 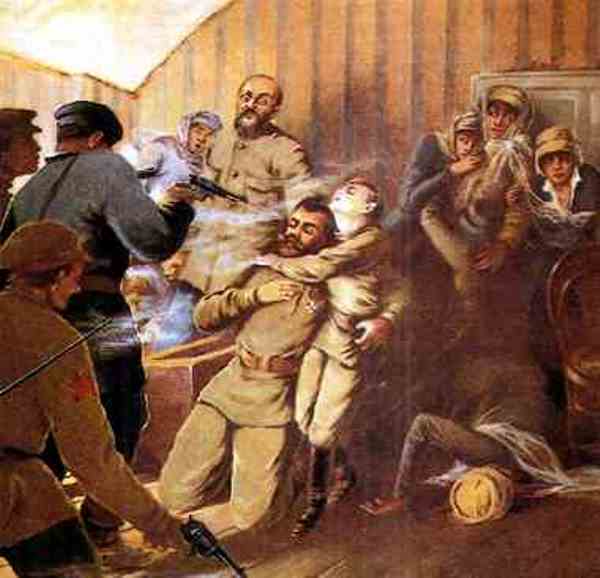 The attempt on Lenin’s life showed the danger of allowing malcontents free rein; under the direction of Dzerzhinsky, the Cheka is now free to round up, interrogate and kill any potential threats to Soviet power. As the Cheka operates completely outside any legal restraints, no one in Bolshevik controlled areas is safe from them. Which is as it should be: the purpose of the Red Terror is to terrify. Note: I recommend having a look at more of the pictures by Ivan Vladimirov. 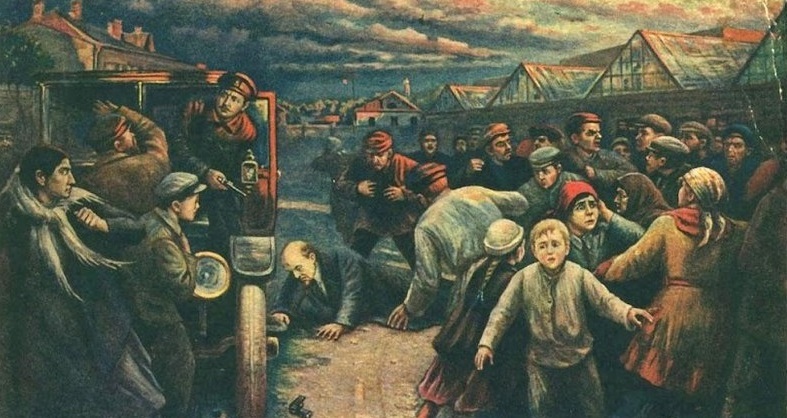 In his later careeer he produced socialist realist hackwork, but his pictures from the Civil War and the early stages of the Revolution are quite chilling depictions of social breakdown. Since the end of April the former Tsar has been imprisoned by the Bolsheviks in Ekaterinburg. At first he and his wife were held there alone, in the ominously named House of Special Designation, but they were subsequently joined by their five children. The Bolsheviks have had difficulty deciding what to do with the Tsar. Trotsky favoured a show trial, relishing the prospect of leading the prosecution. But other Bolshevik leaders were less enthusiastic; the Tsar remained imprisoned while his captors dithered. Then events force a decision. The Czechoslovak Legion is expanding its area of control and now has Ekaterinburg surrounded. With the town likely to fall, the Bolsheviks fear that the Tsar will become a focal point of counter-revolutionary resistance. To prevent this, orders are sent from Moscow (possibly by Lenin himself) to kill the Ekaterinburg prisoners. In the early hours of the morning, the Tsar, the former Tsarina, their four daughters, their haemophiliac son Alexei, and their last four retainers are herded into the basement of their prison, ostensibly because they are about to be transported to a more secure location. 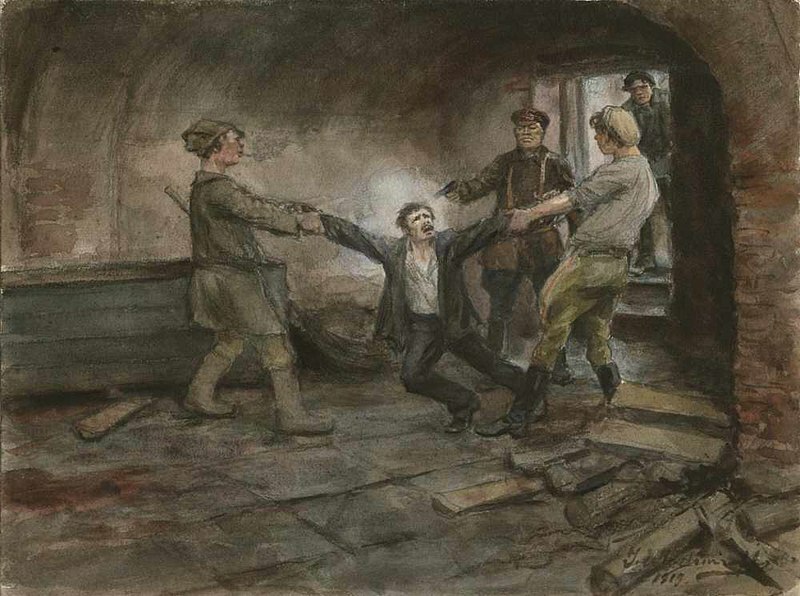 But then armed men burst into the cellar and Yurovsky, the chief jailer, reads out the execution order. The Tsar is confused and asks him to repeat it, which he does. Then the execution squad opens fire. It somehow takes the squad more than 20 minutes to kill all their victims, with some having to be finished off by bayonet, but at the end of that time the former royals and their retainers are all dead. The only surviver is Joy, Alexei’s pet spaniel. The bodies are then taken away to be buried in secret. The Bolsheviks in Russia are embattled, with counter-revolutionary forces threatening their rule across the country. The Czechoslovak Legion provides a particularly potent threat, controlling the Trans-Siberian Railway; working in alliance with the Komuch government in Samara they threaten to bring an end to Bolshevik rule. Vladivostok has fallen to the Legion, which they now proclaim to be an Allied protectorate. The Allies begin to think of using the port to aid anti-Bolshevik forces in Russia, with the ultimate aim of bringing the country back into the war against Germany. President Wilson goes so far as to suggest that Japan could send forces to secure Vladivostok, allowing the Czechoslovaks to redeploy further to the west. But the Bolsheviks face other threats further to home. When the Bolsheviks seized power last November, they did so in alliance with the left faction of the Socialist Revolutionary Party (the Left SRs). However the Left SRs were not supportive of the Brest-Litovsk peace treaty with Germany, seeing it as a betrayal of the revolution. Left SR commissars resigned from Sovnarkom, the Soviet government, but the party remained broadly supportive of the soviet regime, a kind of loyal opposition. Since then they have become increasingly disenchanted by the Bolsheviks’ authoritarianism and their perception that the country is being transformed into a German client state. Now the Left SRs decide to act. 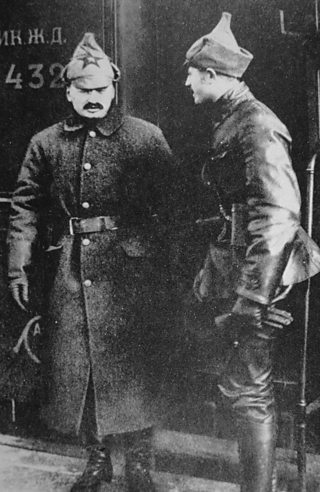 One of their activists assassinates Count Mirbach, the German ambassador, an act of propaganda by deed intended to ignite a general uprising of the masses against the Bolsheviks. When Dzerzhinsky, Lenin’s head of the Cheka (the political police), tries to arrest the murderers he is himself arrested: most members of the Cheka in Moscow are in fact loyal to the Left SRs rather than the Bolsheviks. The Germans are understandably furious at the murder of their ambassador. Lenin is summoned to the German embassy where he issues a grovelling apology. His situation is now desperate. The Left SRs have far more armed men in the capital than he does: if they press their advantage the Bolshevik regime could find itself decapitated.